What Is Energy Healing (Medicine)? Energy healing is in the realm beyond what we can “see” these are forces which affect us on the physical level every bit as much as the medicines we use. Power for change is clearly available in immune-boosting foods such as medicinal mushrooms, detoxing probiotic foods, and pain relieving massage and acupuncture. If you think about it, though, the actual healing takes place inside, at the level beyond what our eyes can see and our hands can touch. How Effective is Energy Healing? As with anything, some things work for some people, and other things don’t work…but they often can work for someone else! Belief systems and receptivity are at play here, big time, don’t you agree? • Reset your nervous system with acupuncture, breathing, prayer, a walk in nature, using Emotional Freedom Technique, and many more ways than I can name here. But what about other “pure” energy-healing modalities? We covered the “how” with Polarity Therapy in an earlier article. Many of these same principles apply (more or less) when employed by skilled practitioners of Acupuncture, Reiki, and other energy healing modalities. • Yes, energy medicine really works for stress, grief, PTSD, pain and more. • I’ve seen a single session of Reiki solve a digestive system issue. For several months this woman had been seeing a Gastrointerologist. Her first time ever with Reiki, and when she got up from the massage table, her problem was gone! • EFT (Emotional Freedom Technique) is a Self-Healing modality based on “Tapping” the Chinese Meridian System while making affirmations which reprogram the subconscious. It works to release old habits and thought patterns. We have seen clients experience emotional breakthroughs with EFT. We have a weekly, facilitated EFT group meeting at the clinic. Call us for details. (239) 277-1399. It is well-documented in stories and science. In the Bible, Jesus performed Miracles using a Love Force, an Energy Medicine. Scientists have performed elaborate experiments which clearly measured an energy field coming from the hands of healers. Hospitals have EKG’s and MRI’s to measure energies emitted by the heart and brain. Science now can measure our heart fields 50 feet beyond our bodies. When we are in a space with other people, our fields mingle in a way that scientists call “Entanglement”. And science has explored a related connection between living cells at great distances. At his death, Einstein was still bothered about this. He called it “Spooky connection at a distance.” Modern science has now confirmed this connection and The Heart Math Institute is well known for their experiments which uncover how energy fields work. Many experiments, including those conducted by the inventor of the Lie Detector Test, are fascinating reads in the book, The Intention Experiment by Lynn McTaggart. The Chakra Systems used in Ayurvedic Medicine and the Meridians used in Chinese Medicine are structures used to guide the intent of the healer. The dips and indents in the body structure are typically the points along the Meridian system which are used by Acupuncturists. Recent research in the U.S. has used MRI’s and other tools to validate such theories. One study from the University of Michigan in 2009 discovered that Meridian pathways flow thru areas in the body with strong, connective muscle and bone junctures. Another was completed in 2016 in Korea. I recently saw a lengthy documentary from the BBC called “The Science of Acupuncture”. It starts with a young woman having open heart surgery with acupuncture for her anesthesia and ends with several very excited medical doctors and researchers’ whose lengthy and costly experiments discovered that the center of our brains, the Amygdala, (which is the source of our pain network), calms its firing when certain acupuncture points (along the Meridians) are activated with extremely tiny acupuncture needles. No wonder acupuncture works so well for pain! See stories of healing with acupuncture here. But I digress. In this article, we are also exploring the other energy-healing modalities such as Reiki and Polarity Therapy. So, let’s move on! It is clear that a human’s intent to heal (or “not”, at the subconscious or conscious level) does translate to the physical level. Bruce Lipton, a developmental biology researcher and one of the world’s first stem cell researchers (back in the 1960’s), wrote one of my favorite books on this topic called “The Biology of Belief”. He also talks about the Placebo and “Nocebo” effect in a short, recent video. We have powers that many people “give away” to those in white coats, a pill, or a philosophy. It’s time to wake up and remember: We each have healing power too! Reiki practitioners are trained and “attuned”, a mystical transference of energy consciousness from the teacher to the student. Practitioners use a variety of both hands-on touch and working in the energy levels surrounding the body. I am a Reiki Master, and along with all other conscious healers engaged in a session, I access what’s often referred to as “universal energy” in order to encourage emotional or physical healing. Regardless of whatever else occurs in a Reiki Healing session, I have observed that each person feels a sense of deep relaxation when we are complete. That can only be a good thing. 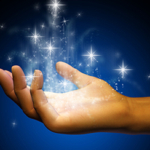 Reiki, EFT, and other energy healing modalities can be used for self healing. It also works well on pets who typically respond quite well to the loving energy. It seems to work on the parasympathetic nervous system to gently relax the recipient. Also, being in the service of healing brings feelings of love & compassion which relax the person giving the Reiki. At Lotus Blossom Clinic, we are fortunate to have three Reiki practitioners. Last year a young woman came to the clinic with the desire to try Reiki for the first time. We had a good session, and she left calm and pleased. The next week she came back for another session with me, and excitedly announced that her constant burping problem had gone away. She had been seeing a Gastroenterologist for several months and been on various medicines…all with no success. With one Reiki session, it completely disappeared. No one was more surprised than me! As a Reiki Healer, it is certainly good—but is not necessary to know– a client’s issues. My role is to be in a compassionate, non-judgmental state and to energetically claim “the highest and best” for the person as I let the energy medicine do its magic. This is my own story. Two weeks before Christmas in 2014, I received the dreaded phone call from my brother in Denver: “If you want to talk to Mom before she passes, it has to be now.” That evening, she passed peacefully. The next morning I could NOT get out of bed until my husband gave me an acupuncture treatment for grief. I was still crying and in deep grief, but at least I could begin to function, find my keys, etc. But that wore off the next day. I went to a Reiki Share session and was fortunate enough to receive treatment from 3 skilled Practitioners. Amazingly, my parasympathetic system calmed in the same manner as it had with the physical needles. Now, moving into another realm of Energy Healing, let’s hear the experience of a happy recipient of Polarity Therapy with Larry Witzleben. One Man’s Recent, Life-Changing Experience, Polarity Therapy & Drive-Thru Stress Relief! “When Larry first assessed my situation, it was best described as “hectic”. I had been working on a project, plagued with delays and cancellations, for more than 5 months. The process had created an unhealthy case of insomnia which had left me so incredibly stressed — or was it vice versa?—with my mind and whole body running at very high RPM. I had become so used to feeling the anxiety that it became “my norm”; there was no way to relax. Now, it is really important to mention that what Larry has created–his Drive-Thru Stress Relief session–is so much different and more valuable longer-term than traditional “massage therapy”. I have always taken good care of my body with massage and chiropractic care, so I know what it feels like to experience the physical benefits of massage. For me, the difference after his treatment was a calming of my entire system, not just physical pain relief. The best way to describe the difference in my central nervous system would be the analogy of driving towards an intersection as the traffic signal turns yellow. I used to hit the “gas pedal” and race through. Now, I am content slowing down and waiting for the light to turn green again. It is a very peaceful, calm feeling. After each session with Larry, my system would become deeply relaxed. After my 3rd session, though, I had a very unique experience. I found myself able to sleep soundly that night and then remain in such a relaxed state that I was comfortable enough to stay on the couch and drift in/out of sleep the entire next day. It was allowing my body/mind to accept the rest it had so badly needed, a welcomed relief that was (5) months overdue. We often say: “There are many ways to heal, and we have some great ones.” While Energy Medicine may not be for everyone, there are people for whom it’s the only thing that seems to work. And when you think about it, since science says we are nothing but energy moving at different frequencies than our surroundings, it seems to be a logical choice to use energy medicine, either by itself or integrated in any overall therapies which you use.